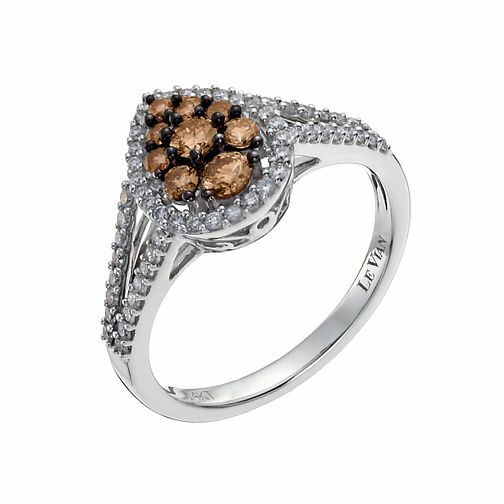 A stunning diamond ring from luxurious jewellers Le Vian. Double Vanilla Diamond set shoulders lead up to a delectable Chocolate Diamond teardrop cluster, surrounded by a sparkling Vanilla Diamond halo for outstanding radiance. Matching band SKU 6205631. Le Vian 14ct white gold white & Chocolate Diamond ring is rated 5.0 out of 5 by 7. Rated 5 out of 5 by Anonymous from Sparkles and shines Perfect.love everything about this ring. Love the color of the diamonds. Rated 5 out of 5 by Anonymous from Beautiful ring When I saw this ring straight away I knew my partner would love it. And of course she said YES! !